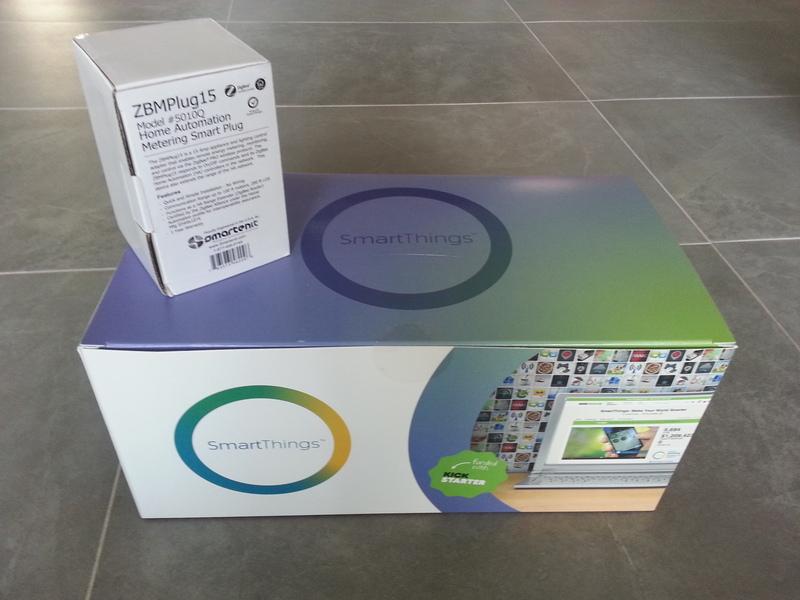 This weekend I unpacked a SmartThings hub and sensor package as part of my quest to really understand the how connected devices will evolve in the home. Six days in, I’ve already learned so much about the connected home that I could write a post a day until August. I may just do that. But before I go into what I’ve learned about the connected home market, I want to share the impressions so far from my time with the SmartThings hub. As one of the first of these systems on the market seeking to combine devices using many different wireless protocols with an easy-to-program interface, it’s one of several options that buyers who want to rush into the connected home might consider. Others are Revolv (used to be Mobiplug), which is expected on the market this Fall; the Lowe’s Iris system available today, a custom Insteon system like what my colleague Kevin Tofel has built; or even the AT&T Digital Life service that launched in April. SmartThings shipped its first devices in April to people who supported its KickStarter project and it is taking pre-orders on the site. Tyler Hall, with the company, said that SmartThings will have a new crop of hubs and sensors available in the coming weeks but that because they are fulfilling backorders the wait for a hub may be as long as three months. A package containing a hub and six sensors will sell for $299, but users will also have the option to buy additional sensors. 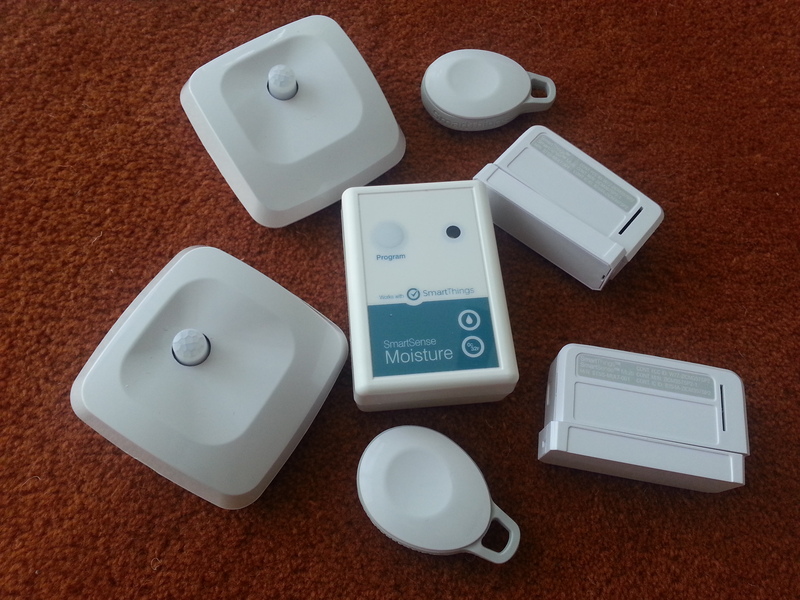 The review unit I opened contained the SmartThings hub, a ZigBee powered outlet, two presence sensors, a moisture sensor, two motion detectors and two sensors that detect motion, vibration, temperature and whether something is open or closed. The entire package would cost about $400 at retail, and for now, the app that controls the system is only on Apple’s iOS. I had the hub plugged into my router and the sensors paired to the hub within 10 minutes of unboxing the set. When pairing the sensors and the hub, it’s better if you get the two within 10-15 feet of each other. That also goes for pairing other devices in the home, so if you’re dealing with a connected thermostat or locks that are far away from your router, you may need a longer ethernet cable and an extension cord for that initial effort. A company representative said I could also plug the hub into a MacBook via ethernet and then use the internet sharing function on my MacBook if I couldn’t find a long enough ethernet cable. The hub supports ZigBee and Z-Wave with access to Wi-Fi via the ethernet cable plugged into your router. SmartThings is building in support for a variety of devices and eventually will offer pairing to other device makers’ clouds. This will allow it to support cloud connected devices like the Philips Hue light bulbs, the Ecobee thermostat and Belkin’s WeMo devices. The current list of supported devices can be found here. Pairing my Z-Wave door locks to the system took about 5 additional minutes, mostly because I needed to unscrew the back plate of the lock to initiate the pairing. I control all of my devices from an iPhone app running on my iPad (I have an Android phone, and SmartThings says that developing an app for my handset is “top priority.”) The app is a bit buggy, and required me to quit the app after pairing devices in order to see them on the system, but Hall promised an update soon. When it came to finding things to do with my new sensors, the app showed off some “recipes” it calls SmartApps, such as one offering to alert me via text when letters arrived in my mailbox, or creating an “away” setting that shut off lights and turned down my thermostat when I left my house. I did get a bit frustrated because I can’t make my own “recipes,” and have to find existing ones that are sometimes labeled fairly generically. However, those who can code do have the option of using the SmartThing IDE to build apps to their heart’s content. But I will confess that figuring out how to take advantage of the sensors will be a longer process, for a variety of reasons I’ll go into in other posts. The short version is that there is fragmentation, which means not all of my connected devices work yet with the system (like my motorized window shades) and I have a lack of connected outputs such as a thermostat that offer me an obvious (and high value) way to use the system. That doesn’t mean I won’t come up with fun and useful ways to add intelligence to my home, but it does mean it’s going to take me a while. Personally, that’s okay, but it might frustrate a user who wants to put a system out of the box and have it perform a well-defined function. But for those users, my next post will be about the three devices I think you need to deliver the biggest bang for your buck with one of these systems. TO STACEY..i must say that you are the wizz lady..i got to tell you iv come up with a super idea..that needs a very good software desiner..because it will make millions..and i feel that you have the mind to do this..and it will be a hot seller..pls email me..and i will tell you what we need to do this..and it will be a very hot seller..im a master transmission rebuilder and desiener for 41 years..is what in a master at..so pls email and we work things out we can make millions.this i promice you..RICK PASEK….EMAIL AT rickpasek33@wowway.com from mi..48101 PLS EMAIL ME A.S.A.P. THANKS AGAIN …7-11-13 RICK PASEK TALK TO YOU SOON BY NOW.. I have setup my SmartThings system a few weeks back. I had ordered the developer kit. It was very easy to setup. I also setup some modules both ZigBee and Z-Wave outside of what was provided. I also setup the Nexia Door locks – it was a bit of challenge to set them up because they were already installed and my SmartThings hub was far away. I am observing some latency and responsiveness issues in operating some of the modules but I need to work on it some more to make sure it is not a range issue. The biggest pain point I feel is that the IOS app – the tiles are difficult to distinguish on what they control. Easy to use system that works well in combination with my iPhone. Look forward to software updates as current version looks nice but is somewhat rudimentary. I’m in the middle of setting up a system running on a Raspberry Pi with the free FHEM Home Automation package. I’ve connected up over 12 different sensors so far – but like you it’s the “missing” connections that create frustration. Trying to combine wireless sensors with different frequencies can be really trying – what is missing is a standard for data formats and frequencies! Oh man, there is definitely a post coming on frequency and protocol fragmentation. But I’m finding a lot of really positive stuff too. Like having a bunch of connected sensors around has already sparked some creative uses. For instance i take many doses of Advil every day but i have a hard time remembering if i’ve already taken them. So surrounded by sensors, I just grabbed a motion detector and popped it over an opaque coffee cup filled with my pills. I set up a smart app to text me when motion is detected on that sensor. Now when i take my pills i get a text i can refer back to. Sure, it’s not elegant, but it’s kind of awesome to suddenly have hte power to connect the physical and the virtual. Hi Stacey. We’ve linked your Blog on our FB page. Regards, Paul @ Resolute AV Ltd.
how so you actually pair the devices? Pairing the outlet required plugging it into the wall and hitting the add devices button on the app. Hey Stacy, what door lock do you have? I’m trying to find one that doesn’t have a giant keypad on the front and looks fairly normal for use with my SmartThings, but haven’t had success yet. Cheers! i have a Kwikset Z-wave lock, but we wanted the keypad. My husband wanted to be able to enter without a key or his smartphone. 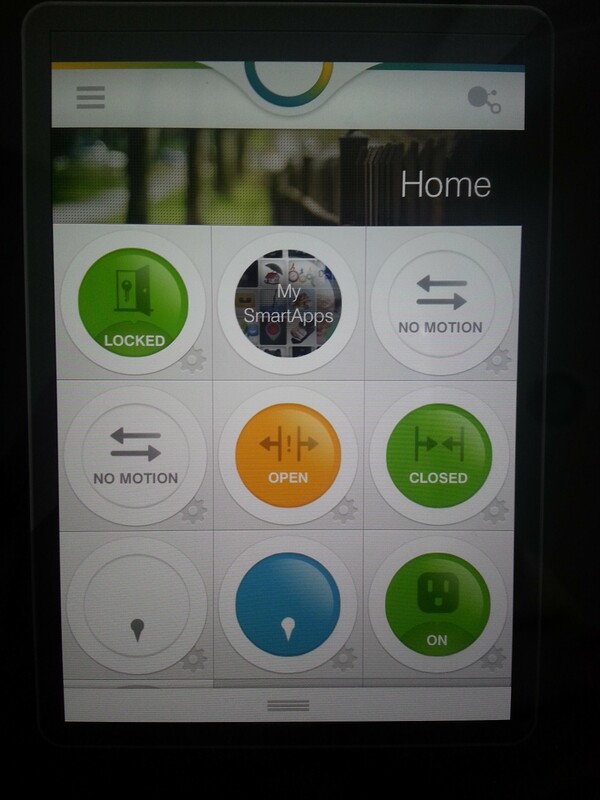 In December several new locks are hitting the market with bluetooth and no keypad. August and Goji. Not sure if Lockitron has a keypad. August is pretty much it as far as I can see, too.